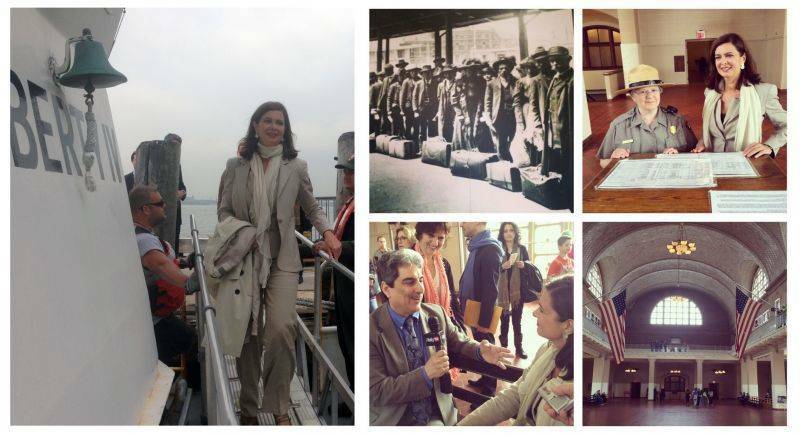 This interview will be broadcast on TV in our weekly episode of i-ItalyNY (NYC Life – Channel 25, for the NY metro area) as part of the presentation of the visit to the Museum of Immigration at Ellis Island by the President of the Chamber of Deputies Laura Boldrini. President, you’ve just spent the last moments of your visit here at Ellis Island. This is your first visit, right? Yes, it’s definitely my first time here. I had been in the US before, but never at Ellis Island. It was deeply moving for me. I strongly wanted to come here as President of the Chamber of Deputies. This is the place where millions of Italians arrived and it’s very meaningful for our migration history. Listening to the stories of the migrants being processed here, the description of their feelings when they arrived, it was a bit like reliving their experiences. Especially because their state of mind was the same I recognize in so many of the people I have met during the years I worked at the UN Refugee Agency. The same sense of relief for having made it to destination, the same anxiety of not knowing anything, not understanding the language, the fear of the future, the feelings of happiness coexisting with inevitable disorientation. Our guide explained how the processing procedures were obviously different, but still efficient: the system worked well. The admission criteria were quite strict, but only about 2% of the migrants didn’t pass the Ellis Island screening. The system was effective, with a health and a legal screening, but not too selective. There was a desire to allow people in: they represented the vitalizing energies that would contribute to the development of the Country. And this is exactly what constitutes the foundations of the US. This is the living proof of how immigration can be a resource, of how the Italians contributed to this Country in so many areas. During this visit I was glad to meet the old migrants, but also the new ones…the newest generation of talents, scientists, startuppers that find opportunities here. Again I have mixed feelings. I am proud that so many Italians are succeeding in this Country, that they are respected and so highly regarded. On the other hand though, there is disappointment for not being able to bring these talents back to Italy by offering the prospect of an engaging and gratifying career path. Our Country will stand tall only once we’ll be successful in attracting these talents back, while now they prefer remaining abroad because a Country like this offers all the opportunities that Italy denies them. I would like to clarify this point. The vast majority of the people arriving in Italy by sea are fleeing wars, dictatorships and persecutions. They’re asylum seekers and should be treated as such, both in the public language as well as from the political point of view. It’s a phenomenon common to most of Europe, the numbers of the asylum requests in Italy aren’t higher than in other European countries. The most dramatic aspect of this migration that affects Italy is the risks these people take, the crossing of the seas that is like Russian roulette, where people get onto these dinghies without the certainty of making it to the other side. This is the real emergency and the dramatic situation that the other countries don’t experience and we need to make our European partners understand that this is a shared responsibility. Saving human lives is a moral duty, an imperative that cannot be fulfilled only by Italy. I am very proud of what we do, but I wish it were a collective commitment of all the member states. Although there is an attempt to create common standards, to date each Country has its own immigration and asylum politics. On the asylum topic there are at least some European directives that establish standards. But if we want this to become a European issue we would need to renounce sovereignty on migration, and obviously it becomes difficult to expect more support from Europe without giving something up. What will remain with you after this Ellis Island visit? First of all respect for those who lived this experience having the courage to leave their homeland to reinvent themselves in a new Country. Respect, because it takes great energy to do all this and when you leave you have no certainty about your future. The feelings remain unchanged. What the Italian immigrants arriving here in the US suffered, is being felt these days by the migrants landing on our shores in Italy. That’s why I think we should respect those who arrive on our shores and not consider them a threat. Also, us Italian Americans living in the US should always keep in mind what our grandparents lived through to help us better understand what is happening today. Special thanks to Giovanna Pagnotta for her collaboration in writing this piece.